On July 19, 2016, Mohammad Al Jarboai, his wife, and three children pushed a loaded luggage cart into the crowded waiting area of Terminal 5 at O'Hare International Airport. They had just landed after a 13-hour flight from Amman, Jordan. On the right, people were chatting at a cluster of tables next to a McDonald's. Al Jarboai wondered what the people were saying, but the crowd pushed him onward. A man near the door caught sight of the family, walked over in no hurry, and extended a hand. "Welcome," he said, before pointing the family to a taxi and giving the driver an address. Al Jarboai, 32, had been a refugee for three and a half years and had known for 15 days that he was bound for Chicago. But as he rode down the Kennedy Expressway, he watched the colorful cars with gaudy license plates passing under highway signs labeled in a foreign alphabet—and realized he didn't know where he was or where he was going. He is from the Syrian village of al-Hirak, where the distance between the curb at O'Hare and the Kennedy on-ramp would span several towns. A nearby Roman amphitheater marks the ancient capital of Arabia, which is home to one of the world's oldest cathedrals, which stands next to one of the world's oldest mosques. Ask someone where they are from and the answer begins, "Well, 700 years ago . . . ."
Most people live in homes that have living rooms filled with plush couches separated by small coffee tables, each with a dish of hard candies at the ready for guests. The tiled floors are washed clean with buckets of soapy water and dried by the afternoon breeze. Glimpses of olive groves and snow-covered mountains waver between silky window curtains. Meeting eyes with a neighbor prompts the obligatory invitation. "Welcome," the host might say, with a wave toward the couches. "The house is yours," as the saying goes. The couches are now empty, the ruins destroyed. When the war started in 2013, Al Jarboai fled Syria for a small Jordanian city called Madaba. He found work building homes on the outskirts of town, got paid poorly, and risked being discovered, detained, and sent back to Syria. While Al Jarboai worked, his oldest son started going to school. First, he would clean the room until the Jordanian students finished class. Then he would study for two hours. Then he would be sent home. Al Jarboai and his family waited in Jordan for a year, then two, then three. Then, in early July 2016, he got a call from an unknown number. He was told that his family's background checks, medical tests, and interviews had been approved. A federal contractor had assigned his case to a national resettlement agency, which in turn assigned it to a local resettlement agency. He'd fly to Chicago in two weeks, the voice on the phone told him, and needed to find a building on Jordanian University Street opposite the University Hospital in Amman. There, the International Organization for Migration held a three-day cultural orientation, in which Al Jarboai learned that, when he arrived in the United States, a caseworker from the local refugee resettlement agency would take him to his new home. Before Al Jarboai got into the taxi at O'Hare, he tried to imagine what this new home would look like. He knew that many houses in the United States had wooden floors. But when the taxi came to a stop in Rogers Park, he looked up at the door of a Super 8 motel. Al Jarboai's resettlement agency, Ethiopian Community Association of Chicago, was unable to find units fast enough to keep up with the high number of arrivals in 2016. Landlords were asking for one year in deposit and proof of employment. "It felt exclusionary," the agency's executive director, Aklilu Adeye, said. Adeye started placing refugees in motels and extended-stay hotel rooms. Then the office credit card maxed out at around $80,000. The family spent five days at the Super 8 before being moved to an extended-stay hotel near O'Hare that had the benefit of a small kitchen. Weeks of roaring takeoffs and landings were punctuated by submitting paperwork to the Social Security Administration. Al Jarboai rarely went outside, where he was afraid to encounter the Prohibition-era gangland version of Chicago popularized in Middle Eastern pop culture. He didn't speak a word of English. Al Jarboai is one of five million people who have fled Syria since 2013 and one of 84,994 refugees who came to the United States during the last year of the Obama administration. Six months after he arrived at O'Hare, a crowd of people holding signs and flags marched by the airport McDonald's to protest the president's travel ban, and dozens of lawyers sat at the cluster of tables with the families of passengers who had been detained. But while the protesters marched and judges handed down rulings, what had happened to Al Jarboai? After about 20 days in the hotel near O'Hare, the resettlement agency found his family an apartment in Edgewater. Finally, he was living in Chicago. As he surveyed the cramped one-bedroom, he heard the lilt of voices on the street. He wondered what they were saying, and felt in some ways more disoriented than he had been listening to the airplanes. "We didn't know how to use the bus—or anything," he recalls. He didn't have a job, or know how to find one. Soon, he'd have to pay $1,100 in rent. After several weeks in Edgewater, a friend told Al Jarboai about the southwest suburbs. He could find more space there, the friend said, for around $900 a month. There were Arab markets, restaurants, and doctors there, his friend told him. It was the kind of community where Walgreens puts up Ramadan signs. In some towns, about 14 percent of people speak Arabic (in Bridgeview, Illinois, around 2,300 out of 16,400 residents), compared to 0.5 percent in Chicago (around 14,000 in a city of 2.7 million). By the time the protesters and lawyers descended on O'Hare, Al Jarboai and his family had left Chicago for Worth, Illinois. A local resettlement agency gets as little as five days' notice before a refugee family arrives at O'Hare. In that time, the staff uses the limited amount of money provided by the government's refugee resettlement program to find and furnish an apartment and prepare applications for food stamps, monthly cash assistance, and Medicaid from the Department of Human Services. Three months after arriving in a city, refugees are expected to be employed, off public assistance, covering full rent, and paying off the loan that they took from a state department contractor to buy plane tickets. This is what resettlement agencies call "self-sufficiency." Agencies are usually able to place newcomers in jobs so that they can pay their fourth month's rent. But Ryan Spangler, who worked for ten years as a housing coordinator at a resettlement agency called Heartland Alliance, said that many refugees immediately fall behind. Some of those families are evicted and a small subset end up in homeless shelters or on the sidewalk. While large families' per-capita government assistance, combined with a job, might cover the rent on a small apartment, a single person's minimum wage or the $304 per month he receives in cash from the Department of Human Services probably won't. Rents in neighborhoods like Rogers Park, West Ridge, Edgewater, Uptown, and Albany Park that have businesses, doctors, and community centers serving refugee communities have gone up as much as $100 per month in the last two years, according to a number of landlords. At least four refugee families in Uptown had to leave their building when rents went up following a gut rehab. Tom Junkovic, a landlord who rents about a quarter of his 200 units to refugees, said that Edgewater is the new Lincoln Park. Self-sufficiency is elusive. Resettlement agencies have started to look for affordable housing outside of these neighborhoods that have welcomed refugees for years. In 2016, an agency named RefugeeOne resettled a Syrian refugee family on a quiet side street in Skokie, about five miles from the halal markets and Arabic pharmacies on Devon Avenue. [Editor's note: The author was a case manager at RefugeeOne in 2016.] Another agency, World Relief, rented apartments for two Syrian families even farther away, near Cottage Grove and 49th Street along the border between Kenwood and Grand Boulevard. A group of volunteers called the Hyde Park Refugee Project helped RefugeeOne resettle two Syrian families in Hyde Park. Large parts of the city were not seriously considered in the search for affordable alternatives. "Given how vulnerable a new refugee is," Spangler said, "we were afraid that the south and west sides would be retraumatizing." Penny Visser, director of the Hyde Park Refugee Project, said that when the Hyde Park families went to their first English lesson in Uptown and told the class that their commute began on Garfield Boulevard, they learned from their incredulous peers—many of whom may have only spent several weeks in Chicago and never traveled farther south than Montrose Avenue—about how "dangerous" the south side was. At first, newcomers are skeptical about why their friends warn them that certain areas are off-limits. But after much repetition, the skeptics start passing on the warnings. Refugees who drive for rideshare companies recount, with the authority of the now-well-acquainted, the first time they unwittingly accepted a request from Englewood or Lawndale. After class, the families nervously boarded the train back to Hyde Park, wondering how they could have missed what their classmates described. Visser said she had to reinforce that Hyde Park, confined between the Midway, Washington Park, 51st Street, and Lake Michigan, was like a small village in a big city, and that it was safe. It is a place, Visser said, where everyone seems to know each other. Her volunteers networked with doctors at the University of Chicago Hospital to get the families medical attention, and with someone who works at Medicaid to help them navigate health insurance. When a baby was due, Hyde Park residents provided diapers and other supplies to last a year. From the remove of Jordan, a new life in Chicago is no more than a vague idea. The first month after arrival is the rhythm of government forms and visits with a caseworker, and then a growing awareness of the city—its markets, doctors, buses, and off-limits areas. But when the resettlement agency stops paying rent and government benefits dwindle, life in Chicago is shaped by the other organizations that provide support. In Hyde Park, a religious group provided student-rate housing for two of the families, which Visser said is how they were able to afford the neighborhood. An organization called the Syrian Community Network provides six months of rental assistance to every Syrian refugee in the city. In years past, the Network also provided cars. Sirat, a Hyde Park-based Muslim organization, offers forgiveness on the loans refugees take out to pay for travel to the United States. Even with this assistance, however, Visser tells of a father who must work three jobs—one full-time, one on the weekend, and a cleaning gig—to make ends meet. Like many newly arrived refugee families, when he started making enough money to barely get by, he lost his cash benefits from the government. Visser said that she and her volunteers "had no idea how minimal the support is." Along 18th Street in Pilsen, vendors count change in Spanish while selling bags of fruit covered in salsa and lemon juice. In Pulaski Park, the smell of golabki wafts from a kitchen. A new market next to the el in Albany Park makes sweets that, before it opened, could only be found in Damascus. The city, however, is changing. Wide­-windowed lofts still fresh with construction dust are taking the place of Pilsen's brick homes and backyard vegetable patches. New high-rises next to el stops demand top dollar as Pulaski Park becomes too expensive for people to stay. Residents march through Albany Park before the next building of tenants is evicted ahead of a gut rehab. Across the country, the cost of housing is rising faster than both inflation and wages, and cities are filling out with tony neighborhoods built for office workers. As a result, resettlement staff have noticed that refugees are moving to the suburbs where there is cheaper housing and sometimes better-paying jobs. Al Jarboai was one of them. Even though his first job at a restaurant in Worth only paid eight dollars an hour, he felt more comfortable because of the large Arab community. Then, someone at the restaurant told Al Jarboai he could earn more driving for Uber. He was soon earning $700 a week behind the wheel, compared to $350 in the kitchen. He then found a job at a tow truck company near Midlothian, Illinois, where he has worked ever since. The national agencies that send refugee families to different parts of the United States are keeping an eye on this suburban migration. Church World Service (CWS) has heard from their 19 local affiliates—in places like Louisville, Kentucky, and Concord, New Hampshire, and Lancaster, Pennsylvania—that refugees are moving from cities to suburbs in search of lower rents. CWS, which resettles refugees through RefugeeOne in Chicago, collects data on average rents, monitors the availability of apartments, and examines refugees' starting salary. In light of the rising cost of housing, Mia Witte, the associate director for resettlement at CWS, said that community support, like that offered by the Hyde Park Refugee Project, impacts the agency's decision on where to resettle refugees. 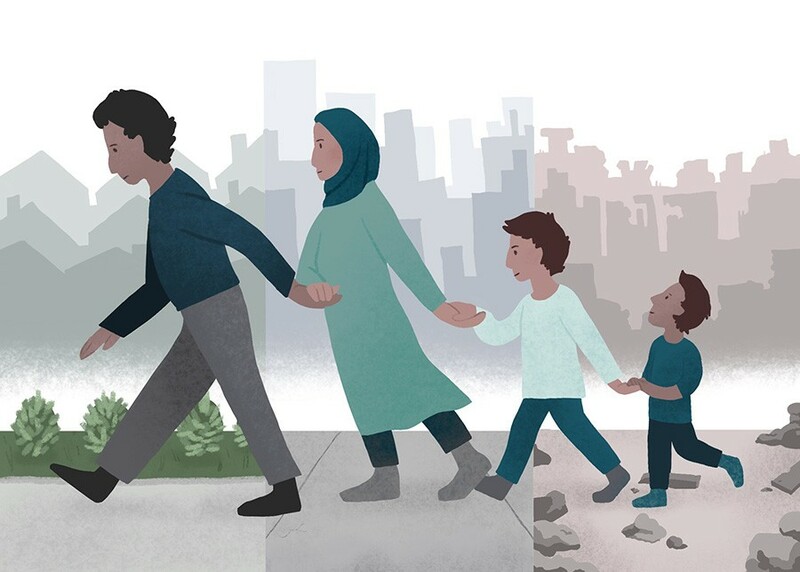 Despite the finely-tuned resettlement apparatus that accounts for everything from medical tests to flights to housing to food stamps, where that extra support comes from—and where people end up because of it—is often a surprise. Amr Othman Agha, 39, who fled Syria in 2013, was among the refugees who arrived in the U.S. during the summer of 2016. He lived in Sacramento, California, for several days before moving by himself to Oakland. For Agha, America was the iron doors and alarm systems that he saw on every home in his new neighborhood. America was the feeling of being told that it wasn't safe to go out after 6 PM. America was paying $500 to share a single bedroom with three other people. After six months, he decided he would go back to either Syria or Egypt. But as Agha prepared to leave, a friend of a friend in Chicago named David Graubard told him to come visit before making up his mind. On December 6, 2016, Agha walked out into the waiting area at O'Hare. Graubard caught sight of him, quickly walked over, extended a celebratory balloon, and beckoned him to his car. They pulled away from the curb and merged onto the Kennedy. When the car came to a stop in Albany Park, Agha looked up at a three-flat. "Welcome to your home," Graubard said. Agha took English classes at Truman College. Graubard helped him find a job as a dishwasher in Lakeview and then as a case manager at the Syrian Community Network in Edgewater. He helped him apply for a green card. In January 2019, after making it through immigration on his way back from reuniting for a brief time with family in London, Agha passed confidently by the cluster of tables next to the McDonald's at O'Hare where the protesters had marched two years before. When he hailed a taxi at the curb, Graubard was at his side, having accompanied him all the way back from Europe, just to be safe. The voices on the street and the signs in a foreign alphabet are now conversations and directions. Agha, who pays for groceries and half of the utilities, still shares the apartment with Graubard, who owns it. The neighborhood has everything Agha needs—a Walgreens, a Jewel, and three bus lines. A nearby police station makes him feel safe. Correction: An earlier version of this story incorrectly stated that Agha pays utilities and Graubard pays rent. Agha pays for half of the utilities and Graubard owns the apartment.